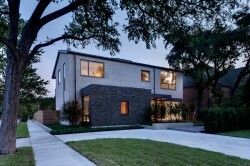 Architect Marc McCollom excels in quiet modernism. 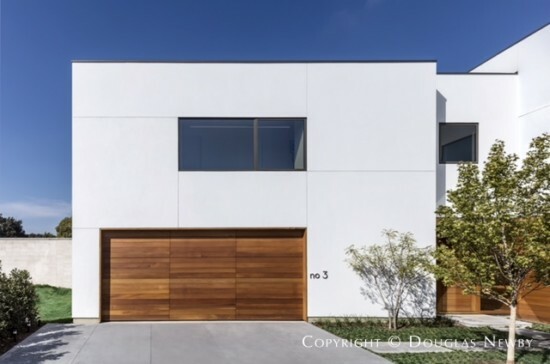 Architecture that is modern, clean and current, but not flashy or loud. Marc McCollom trained with two of the great modern architects in Dallas, Frank Welch and Max Levy, who are great friends and who share a sensitivity for design that Marc McCollom, AIA, responds to and reflects in his work. 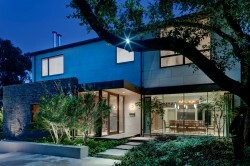 This modern home designed by architect Marc McCollom is one of my favorites. 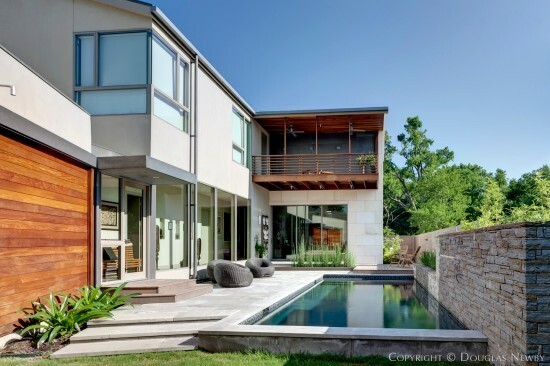 Located in the Winding Lake neighborhood of Preston Hollow, the home is beautifully sited to view the lake and nature through the open sightlines of this modern residence. In a conversation I had with Marc, here are some of his thoughts that help illuminate his work and why his clients are so appreciative of his design and approach. Like Marc, I was raised in Illinois and my grandfather was a farmer, so I was personally interested in Marc McCollom’s early years and the influences from those years. Marc McCollom: I was born and raised in the small town of Villa Grove, Illinois. And even though most of the state is farmland, this particular part of Douglas County is especially flat. I remember looking out the window at night and seeing the lights of distant farms randomly spaced on the horizon. To this day I have a strong connection to the open landscape. My Grandfather was a farmer. I remember the diesel smell and stark chiaroscuro of his machinery shop and the scale and volumes of the combine shed and the corn crib. I now have some of his hand tools. I have always made things. As a kid I made stuff with the scrap lumber from construction sites (we moved from Illinois to Houston when I was 6). Later at Rice, I made sculptures of steel, wood, and stone. After graduating I designed and built custom furniture. I moved to Dallas 20 years ago, went to UTA, and have been making buildings ever since. I always find someone’s academic background fascinating. My undergraduate degree is in social science, but I spent an enormous amount of time my last two years in school in the studio art department of SMU which gave me an incredible understanding of design, proportion and context. Marc explains his academic path. Marc McCollom: Growing up I was the smart kid who could draw, but the smart was valued more and I ended up as a Chemistry major at Rice. After two years I realized that was not what I wanted to do for the rest of my life, so I went back to art. Now I have a BFA in “Making Stuff” (sculpture and painting). The family tree of architects and the influence one has on another is incredible. Marc McCollom shares in this and has a great architectural pedigree. Marc McCollom: I started working for Frank Welch the summer before my last year at UTA. I loved to listen to him describe the project to the client without talking about the design specifically; but talking about the feel and mood of the house. What we in the office did was all the work that was needed to manifest that narrative. After about 2 ½ years with Frank I left to renovate my house in Lakewood. It was a full time job for about six months, then a part time job for about four years (when I was not teaching at UTA or working for Max). The first time I saw Max Levy’s work I thought “that’s the guy I want to work for next.” (I was at Frank’s at the time but things worked out a couple of years later.) Max’s work is appealing in multiple ways, but one of the most important is that like Frank’s it is about the life that is lived in the house, not the house itself. From Max I learned the necessity of diligence and discipline in maintaining the design integrity, especially during construction. As I mentioned the other day on the phone, that was also where I realized that I knew how to put a building together, so I was ready to go out on my own. Here are some of Marc McCollom’s thoughts when I asked him about his work. Marc McCollom: I describe my work as Quiet Modernism: Quiet because it should nurture, not overpower, the lives of those within; Modern because it has a clarity and composition that imbue the house with an air of freedom. I still draw by hand. I believe that the act of drawing lets the brain work naturally, easily moving back and forth between loose and precise, experiential and technical. Drawing’s pace and physicality also help keep me rooted in the bodily realm of Architecture. I also still build models with basswood, chipboard, and museum board. Making models and drawings forces one to really know his project. I believe it is the Architect’s role to resolve all the conflicting parameters and desires of a project into a clear and concise design. The Architect not only has to know all the technical aspects of the construction, but more importantly has to have the artistic sensitivity to use that knowledge to bring delight and humanity to the project. That sensitivity is usually directed toward making the design seem effortless and almost inevitable; a hybrid between natural and rigorous. Things are what they should be, where they should be, and how they should be. Straightforward is good; fussy is bad. Drawing is how I think; if I do not draw it I am not thinking about it. So to maintain design integrity, I draw everything. Lots of options are sketched to scale before the best are hardlined for final resolution. Good design is obviously important; but it is also fragile. Like a work of art, its subtle beauty can easily be overpowered by an obnoxious neighbor. So in some ways, the three most important aspects of architecture are lighting, landscape, and interior design; for if any of those are discordant, they sour the entire project. I take building pretty seriously. 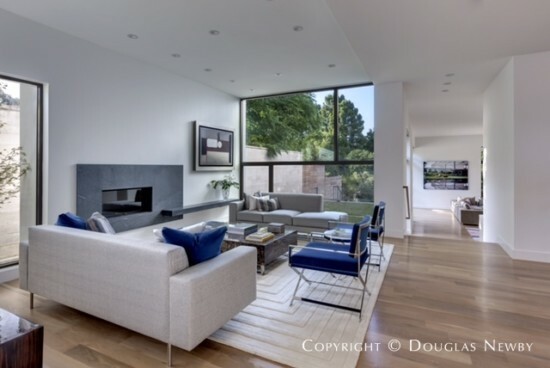 Most residential clients are only going to do this once, so if they are trusting me I am going to give everything I have to maximize the architecture potential of the project, addressing tangible and the intangible opportunities. I want to give them something of substantial beauty, something that is worth building. Generosity is probably the most important characteristic of a good project. Without the Owner, the Contractor, and the Architect all being generous, the building cannot be - it will have nothing to give to those who come to it. I felt this very clearly the first time I visited Temple Emanu-el; the courtyard was there to be enjoyed and the covered walkway gave me room to partake of it; both preparing me for the wonder of the sanctuary. 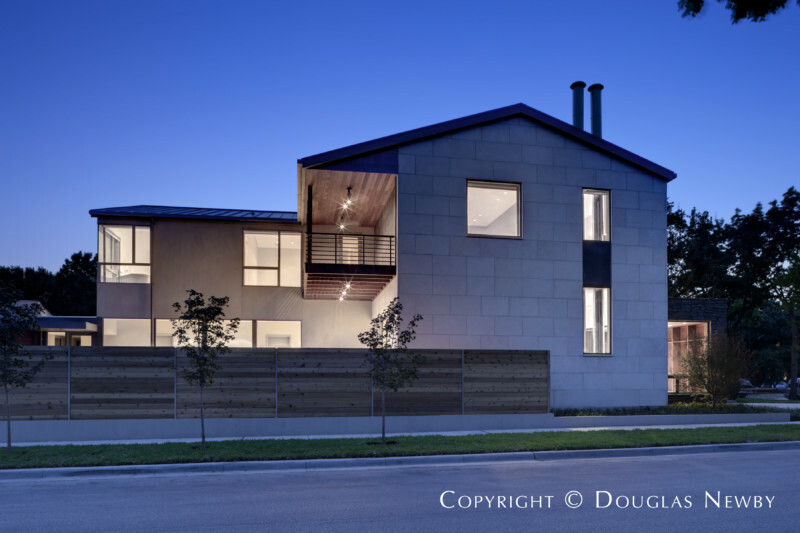 The House of Three Rooms is an architectural project that I admire and Marc shared how he approached this modern home. Marc McCollom: I designed it to be gracious, with generously scaled spaces that were cleanly composed and clearly organized. It was important to be a good neighbor; I used the single story volume of the library to mediate between the scale of the main house and that of the street. The other three houses on the corner are all first generation. The composition and materials needed to be appropriate. Screaming “Modern” was not important to me, a beautiful house was. The overall form wanted to be clean and refined, the shapes and materials honest. The front and side elevations were studied especially carefully; every piece of cut stone cladding was drawn and dimensioned. 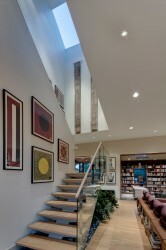 Some parts of the house that could seem contrived are actually natural results of the design process. The balcony hangs from the roof mainly because I do not like the way columns hit the ground. The twin fireplace flues are exposed at the interior partly because a typical chimney would have been too skinny. The ceiling of the master bedroom is concave because I wanted the room to breathe in tandem with the sleeper. The ceiling of the west bedroom is convex to connect the room with the canopy of the live oak outside the overscaled window. I also designed the landscaping, with the help of Jim Vaughn and Scott Nance. The landscape that is there now is essentially the same one I showed in the very first schematic site plan; it has always been part of the house itself.